Kerel Cooper of On The Black and our own David Daniels talk about the 2011 version of the MLB At Bat app for the iPhone. Now is the perfect time to invest in the app before the season starts next week. I have the Android version and love it. I’ve been listening to the Mets spring training games, even when they’re not broadcast on WFAN by tuning into the opposing team’s broadcast. 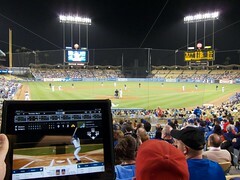 The app has real-time game tracking, a scoreboard, MLB news, and let’s you pick your favorite team. It’ll customize the experience to your team as well. MLB Advanced Media really did a nice job with this version. It’s worth the $15 if you’re a big fan.